Wally World is quickly becoming your new plug. Yesterday, sneakerheads were stunned to find $6,500 Nike Air Yeezy 2s listed on Walmart, but that's not the only Kanye West design that can be purchased through the store. 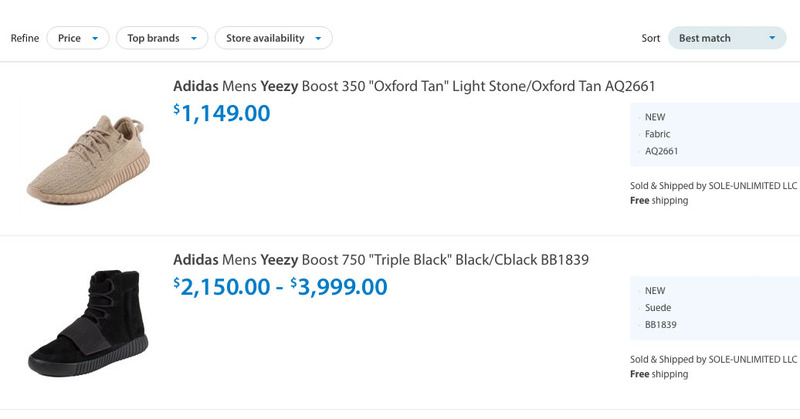 With a quick search, you'll find both of West's adidas Yeezy Boost models on walmart.com as well. Not quite the $6,500 being asked for the "Red Octobers," the Yeezy Boosts are priced between $1,150 and $4,000 for the 350 and 750 models. Again, these shoes aren't being stocked by Walmart, but are listed on the online marketplace through an independent retailer. Still, it's a bit jarring to see some of the world's most expensive sneakers land on a website associated with budget shopping.